Hello Reader! Good News for Sopranos fans. 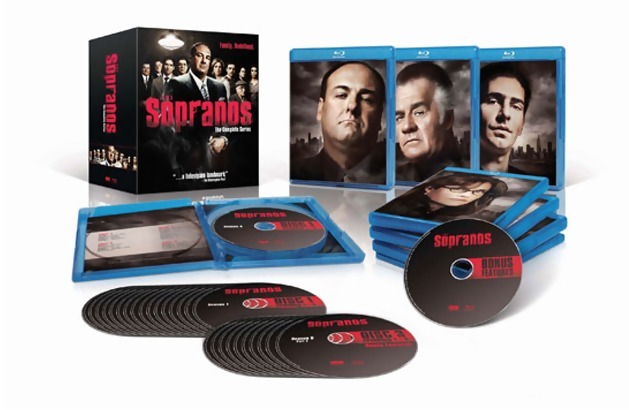 The Sopranos comes to Blu-Ray in a Complete collection box set. I’m in! The Box Set comes with 28 Blu-Ray Discs with tons of Extras and a Digital Copy for each episode. Also comes with new interviews with cast and crew, along with famous filmmakers and academics who explore how the acclaimed series transformed the television landscape. “Defining a Television Landmark,” which runs approximately 45 minutes, features all-new interviews with cast, crew, celebrities, filmmakers and academics — including series creator David Chase, star James Gandolfini, Academy Award winning director Steven Soderbergh, Emmy Award winner Jeff Daniels and Golden Globe winner Steve Buscemi — discussing the impact and influence of the groundbreaking series, with brand new archival footage. Additional bonus material includes lost scenes, two round table dinners with cast and crew, 25 audio commentaries and much more. Synopsis: For six seasons, millions of viewers loyally tuned in to HBO to watch the drama unfold as modern-day mob boss Tony Soprano juggled responsibilities between his family and his other “family.” Hailed as “a remarkable achievement” by the Wall Street Journal and “the greatest show in TV history” by Vanity Fair, David Chase’s drama stars three-time Emmy winners James Gandolfini as Tony Soprano and Edie Falco as Tony’s wife Carmela, plus Lorraine Bracco as therapist Dr. Jennifer Melfi, Emmy winner Michael Imperioli as Tony’s nephew Christopher Moltisanti and Dominic Chianese as Uncle Junior. Other series regulars include Robert Iler as Anthony Soprano, Jr., Jamie-Lynn Sigler as Meadow Soprano, Tony Sirico as Paulie Walnuts, Steven Van Zandt as Silvio Dante, Aida Turturro as Tony’s sister Janice, Steven R. Schirripa as Bobby “Bacala” Baccalieri, John Ventimiglia as Artie Bucco, Vincent Curatola as Johnny Sack, Frank Vincent as Phil Leotardo and Ray Abruzzo as Little Carmine.